David Jonathon Shulkin (born June 22, 1959) is an American physician and politician. 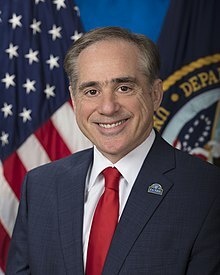 Shulkin was the 9th United States Secretary of Veterans Affairs from February 14, 2017 to March 28, 2018. He served as Under Secretary of Health for the U.S. Department of Veterans Affairs. He was nominated by President Barack Obama on March 18, 2015 and sworn in on July 6, 2015. On January 11, 2017, President-elect Donald Trump announced that he will nominate Shulkin to serve as United States Secretary of Veterans Affairs. Shulkin was born in Highland Park, Illinois. He was raised in Bala Cynwyd, Pennsylvania. He studied at Hampshire College and at Drexel University. He served as the President and Chief Executive Officer of Beth Israel Medical Center in New York City. He also served as president of Morristown Medical Center and as vice president of Atlantic Health System Accountable Care Organization. On January 11, 2017, Shulkin was selected by President-elect Trump as Secretary of Veterans Affairs pending Senate confirmation. Shulkin resigned from a private sector position in 2015 to work in the Department of Veterans Affairs as the undersecretary of health. On February 13, 2017, the Senate unanimously confirmed Shulkin as the U.S. Secretary of Veteran's Affairs with a 100-0 vote. For President Trump's address to a Joint Session of Congress on February 28, 2017, Shulkin served as the designated survivor. In September 2017, The Washington Post revealed that Shulkin spent nearly half his time on a recent international trip to Europe, covered by taxpayers, sightseeing and shopping with his wife, Merle Bari. On March 28, 2018, President Trump fired Shulkin. Shulkin is married to Merle Bari. ↑ Philipps, Dave; Fandos, Nicholas (May 13, 2017). "New Veterans Affairs Chief: A Hands-On, Risk-Taking 'Standout'". The New York Times. p. A1. Retrieved May 14, 2017. ↑ News, A. B. C. (January 12, 2017). "Everything You Need to Know About Trump's VA Pick". ABC News. Retrieved February 9, 2017. ↑ Times, Military. "Trump picks top vets health official as the next VA secretary". Military Times. Retrieved February 9, 2017. ↑ "Trump taps former Beth Israel CEO David Shulkin to lead VA". Advisory Board. January 12, 2017. Retrieved February 13, 2017. ↑ Westhoven, William (January 11, 2017). "Trump names former Morristown Medical president to head VA". Daily Record. Retrieved February 13, 2017. ↑ Yen, Hope (January 11, 2017). "Former chief medical officer at Penn, Temple picked to lead VA". Philly Voice. Associated Press. Retrieved February 13, 2017. ↑ Slack, Donovan (February 13, 2017). "Senate confirms David Shulkin as Veterans Affairs secretary". USA Today. Retrieved February 13, 2017. The Senate unaminously confirmed Trump nominee David Shulkin to be secretary of Veterans Affairs Monday night. ↑ "Philip Rucker on Twitter". Twitter. Retrieved March 1, 2017. ↑ "VA chief took in Wimbledon, river cruise on European work trip; wife's expenses covered by taxpayers". The Washington Post. September 29, 2017. Retrieved September 29, 2017. ↑ Quil Lawrence; Jessica Taylor (March 28, 2018). "Trump To Replace VA Secretary David Shulkin". WGBH News. Retrieved April 12, 2018. This page was last changed on 8 February 2019, at 17:35.